Last week’s release of new ‘Energy and Emissions Projections’ from the government highlighted some major concerns with the UK’s electricity policies. Firstly, it revealed that Britain is off course to achieve its legally binding climate change targets due to an overreliance on gas. Secondly, the projections rest on the delivery of a huge amount of low-carbon generation – a plan that is still riddled with uncertainties. The 2008 Climate Change Act commits the UK to a reduction of greenhouse gas emissions against 1990 levels by at least 34 per cent by 2020 and 80 per cent by 2050. The Committee on Climate Change have stated that meeting the 2050 emissions reduction target “will only be achievable if electricity generation is almost completely decarbonised by 2030”. 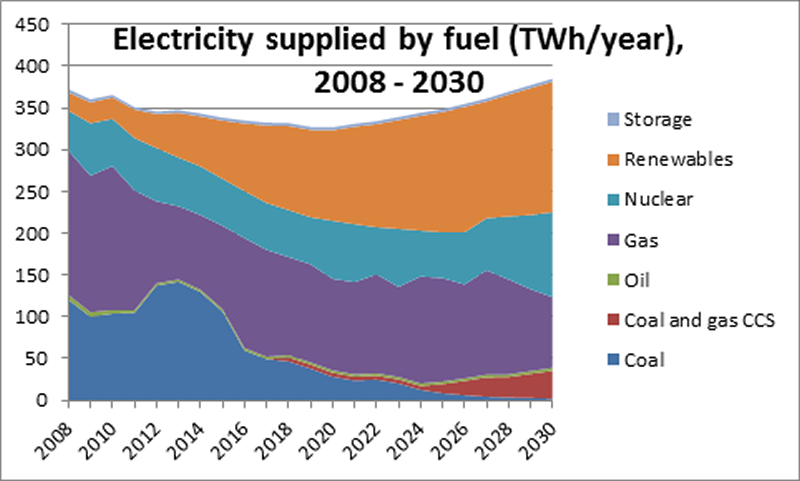 The level of gas-fired generation projected by the Department of Energy and Climate Change (DECC) in the electricity mix in 2030 (shown below) would make this requirement impossible. In addition, given the central role that gas prices have played in driving up electricity bills over the last ten years, this is extremely concerning for consumers (or people – for whom the electricity system should exist). Since claims that UK shale gas could drive down energy prices have been widely discredited, tying the UK into this volume of gas generation risks further rises in electricity bills. The DECC projections indicate that two CCS facilities will come online in 2018 and it assumes that CCS technology will be commercially available by 2025. This is extremely optimistic given that the two projects planned to be online by 2018 are demonstration plants and it is unusual for any demonstration facility to perform as expected or anywhere near a commercial basis. Even if these facilities exceed expectations, recent research has highlighted six significant uncertainties for CCS including construction risk, prohibitively high capital costs and the difficulties of finding storage facilities for the captured carbon. DECC’s figures show a large and increasing contribution from nuclear power. Their Nuclear Industrial Strategy highlights plans for 12 new nuclear reactors by 2030. Again, this is extremely optimistic given the huge capital investment required to develop nuclear facilities, the difficulty the government is currently having in negotiating an acceptable deal with nuclear operators , and the well documented overruns and overspend of recent nuclear development in France and Finland. A huge increase in renewable capacity from today’s levels is also projected. Although admirable, this will require a level of capital investment that the current policy framework does not inspire. IPPR research has shown that the existing policy framework does not yet provide the certainty or aspiration that investors require to deliver the investment that government want to see. These new figures not only show the damaging carbon implications of UK energy policy but also ignore the huge uncertainties that exist around the low-carbon generation that government expects to be delivered. Some of these issues could be addressed with more stable policy that gives a clear signal of government intention such as the setting of a decarbonisation target for the power sector by 2030. But it is also crucial that government focuses on the significant opportunity for reducing energy demand through energy efficiency. The focus of UK energy policy lies far too heavily on the supply side, but government must start to think more creatively about how energy is used throughout the economy, where it can be reduced, and how they can best support that to happen. As new work by IPPR will show, this, more than anything else, would cut bills, reduce carbon emissions, provide jobs, and fill the gap left when generation capacity does not deliver on expectations.